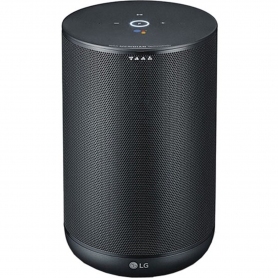 Bring the future of sound home with LG’s WK7DGBRLLK. Equipped with fantastic features, this stylish black speaker will make a great addition to every home. This LG ThinQ® speaker is packed full of cutting-edge features, designed to make your life easier. 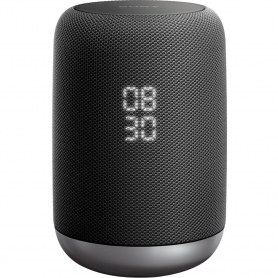 You’ll find the Google Assistant built into this device, where you can ask questions, set reminders and play your favourite music without having to lift a finger. You can also connect the WK7DGBRLLK to other Chromecast audio devices – letting you enjoy seamless tunes throughout your home for gatherings and parties. Or, link up your phone and tablet wirelessly via Bluetooth, so you can enjoy your whole music library in incredible high-resolution audio. Plus, make use of the amazing ThinQ® technology which lets you control other compatible LG devices. Turn on your dishwasher, start cooking meals and even wash your clothes using this intelligent speaker. Sound Upconverting:This LG feature up-converts standard definition audio to near high-resolution quality. So, whatever track you choose, you know it’ll sound incredibly clear. 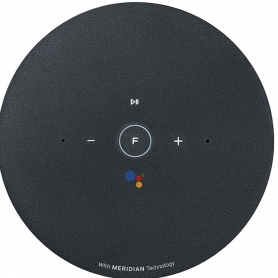 Meridian Audio Technology: Meridian has teamed up with LG to bring high-performance audio to more homes with their cutting-edge technology. High-Resolution Audio: From music and podcasts to films and TV shows, you can experience cinematic 192k Hz / 24 bit sound at home. And, with Clear Vocal technology, you can listen to an artist’s detailed, crisp vocals without distortion at any volume. Or, try the Enhanced Bass mode to really feel the deep, rich, immersive bass notes in your audio. 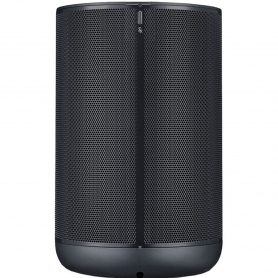 LG’s WK7DGBRLLK is so much more than just a speaker. Control your ThinQ® devices and enjoy your entire music library in high-resolution audio. Shop for yours today.